Two of my favorite things in life are food and cute stuff, and the new Japan Candy Box monthly subscription service combines both in an adorable package! Today, I'll be reviewing the June 2015 box, full of treats including a Popin' Cookin' DIY set, Pikachu pocky-like biscuit sticks, Koala's March cookies, and more! Plus, if you share my undying love for sweets and sweet packaging, read on for the chance to win your own Japan Candy Box! Just about four days ago, I received a cute little box stuffed with all sorts of Japanese snacks and sweets: the Japan Candy Box! It made me unbelievably happy to open the box and try out all the little treats, and guess what? You can get your own box too! 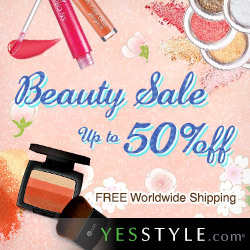 Read through my review post to find out how. 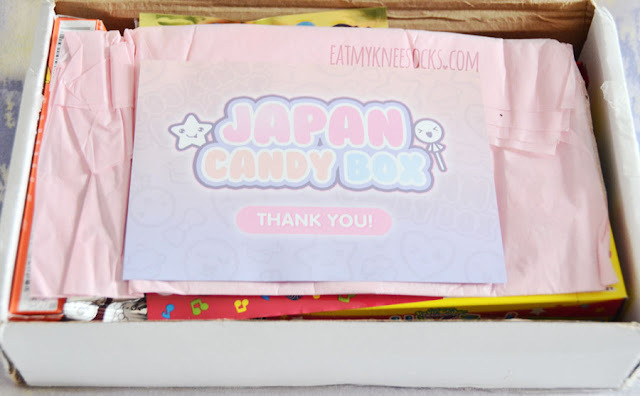 Japan Candy Box is a monthly subscription box brought to you by the same people behind Blippo Kawaii Shop and Kawaii Box, both of which I've reviewed before in earlier posts (Blippo review | Kawaii Box review). 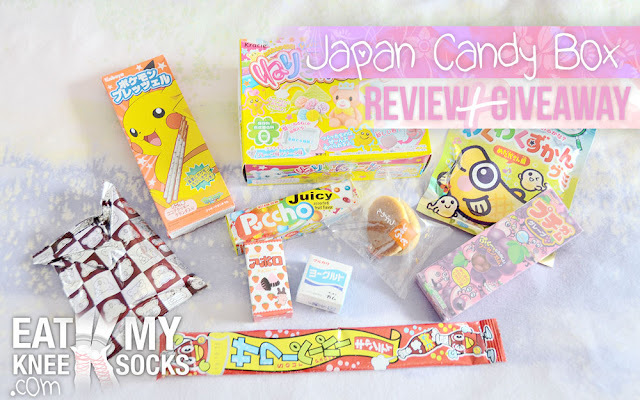 I've had super pleasant and exciting experiences with Blippo and Kawaii Box before, so naturally I didn't hesitate to review their newest addition, the Japan Candy Box! 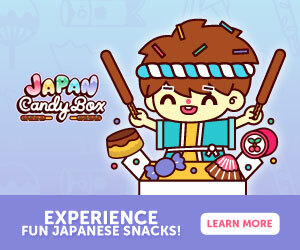 For $19.90 a month ($18.90/month for the 6 month plan, or $18.20 for the 12-month plan), Japan Candy Box delivers a carefully selected blend of cute Japanese treats to your doorstep, with free shipping worldwide. 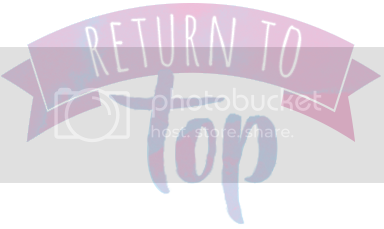 All their stuff is from reputable Japanese brands, including Hi-Chew, Glico Pocky, Hello Kitty, Rilakkuma, Puccho, Popin' Cookin', Meiji, and more. 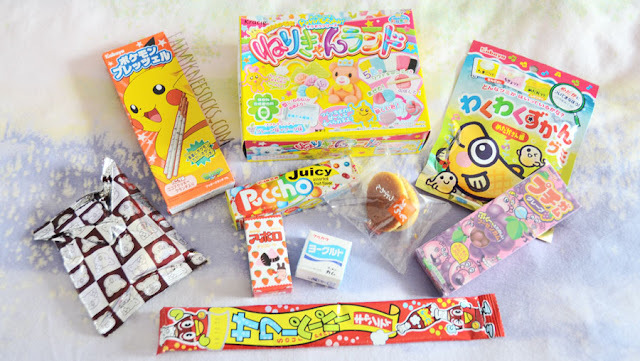 Each monthly box has 8-10 Japanese candies and sweets, ranging from biscuit sticks to chewy candy, with all the adorable packaging and quirky flavors that you'd expect from Japanese snacks. Like the Kawaii Box, the Japan Candy Box came in a simple white box with the cute logo. Inside the box was some tissue paper, along with a thank-you flyer with the information on which snacks were included inside. The June 2015 Japan Candy Box came with 10 different treats, and the box also included some flyers for Blippo Kawaii Store and Kawaii Box! 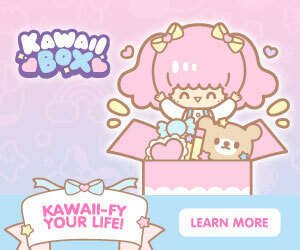 The minute I opened my box, I began screaming (internally) at all the cuteness! 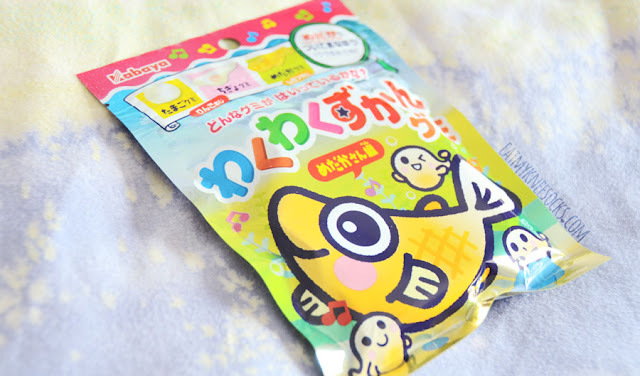 Japanese packaging is so crazy and funny and weird...and absolutely adorable! And now, the even better part: trying out all the snacks! The first sweet treat in the June 2015 Japan Candy Box was a pack of Kabaya Gummies in cute animal shapes. I got the fish version; it also comes in a frog version. What's so adorable and unique about these gummies is that there are three types of gummies in the bag, showing the growth of a fish from an egg to a full adult fish. The three gummies also taste slightly different. They're chewy and not too sweet, but definitely very cute. 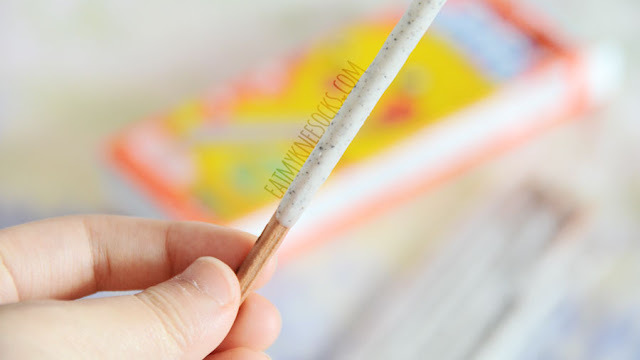 The June 2015 Japan Candy Box included something I've always wanted to try: the popular Japanese Popin' Cookin' DIY candy kits. 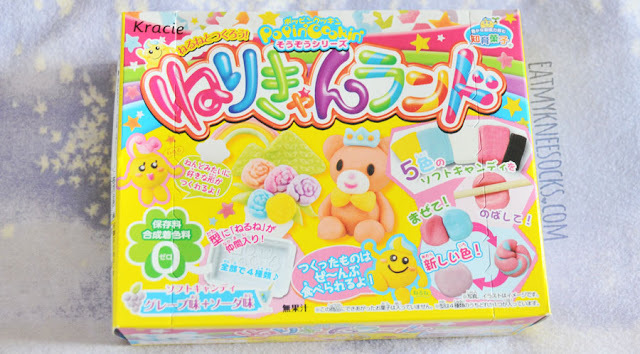 With this kit, you can create a bunch of cute creatures out of edible candy material. I haven't tried making anything yet, but I'm looking forward to assembling my own tasty animal friends soon! The third item in this Japan Candy Box was a pack of Kabaya Pokemon biscuit sticks, similar to Pocky. I believe these came in a cookies-and-cream flavor, or something of the sort. Some of the biscuit sticks were broken when they arrived, but nonetheless tasty. They're not very sweet, and they've got a nice crunch to them. Anyway, this bubblegum is super cute and fun to eat; the individual pieces are small, but you can stack them up or grab a handful for more flavor. 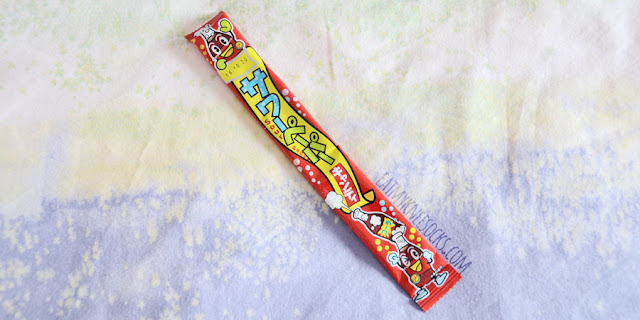 An interesting treat in this Japan Candy Box was the Puccho juicy fruit-and-yogurt-flavored chewy candies. 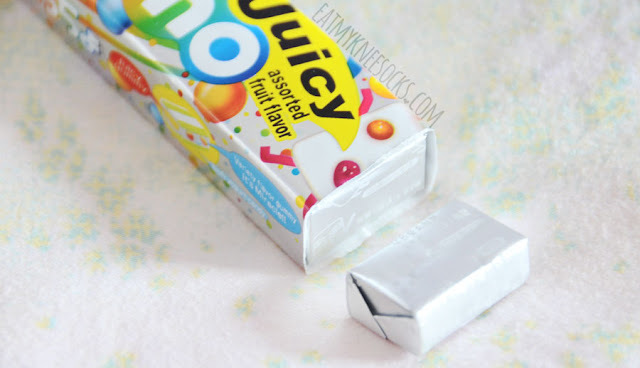 These gummy candies have a milky yogurt-like base, with small fruity gummies inside for extra flavor. I really like these; they're not overwhelmingly sweet, but still creamy and delicious. One of the small little boxes that I got in the June 2015 Japan Candy Box was this set of four Marukawa Fusen bubblegum pieces. I'm not 100% sure what flavor it is, but my guess is milk. I don't chew gum a lot, but these are pretty good. 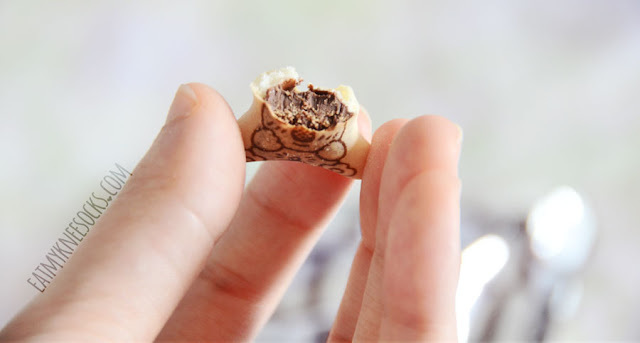 They have a crunchy shell, with a sweet flavor that lasts for a bit. A funky and unexpected item in this Japan Candy Box was the Yaokin Sour Paper Candy, a thin and chewy piece of sour-and-sweet candy. This one is soda-flavored, and tastes a lot like Coca-Cola. It's not too sour, and it looks weird but tastes nice. My personal favorite from the June 2015 Japan Candy Box is without a doubt the mini dorayaki cake. Dorayaki is a popular traditional Japanese dessert, made with pancake-like castella wrapped around a sweet red bean center. It's essentially a red bean-flavored pancake sandwich, and it's one of my most loved of Japanese treats. 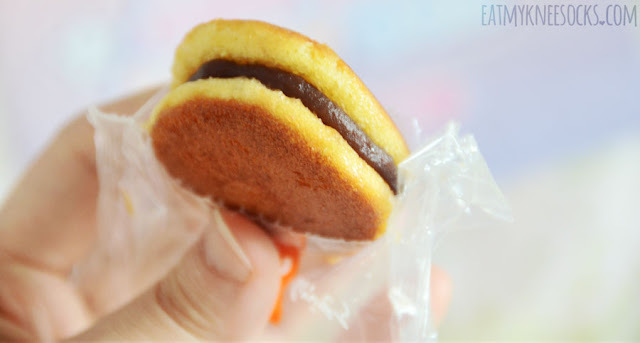 This mini dorayaki cake is super cute; it may be small, but it packs all the flavor of dorayaki. I love the combination of the fluffy, lightly-sweetened pancake "buns" and the super-sweet, creamy red bean paste. Eating it brought back memories of my trip to Japan, and, needless to say, I love the taste. Another mini snack in this Japan Candy Box was a box of Meiji chocolates. The one that I got had a bunch of tiny strawberry-flavored (and strawberry-shaped) chocolates. 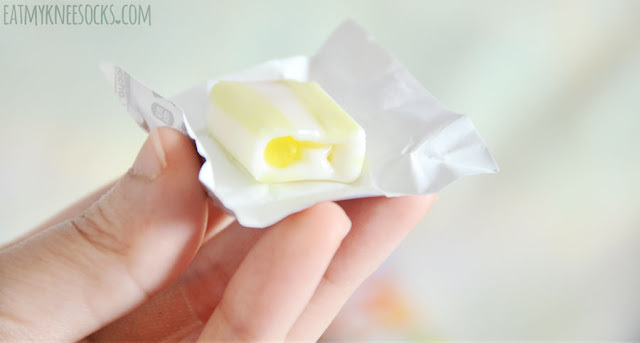 As with the Meiji Petit Bubblegum, each small piece doesn't have a lot of taste, but a couple pieces together tastes great! The tenth and final Japanese snack in the Japan Candy Box for June of 2015 was a pack of Lottle Koala's March chocolate-filled biscuits. These are one of my favorite Asian snacks, and I've had a lot of them before. 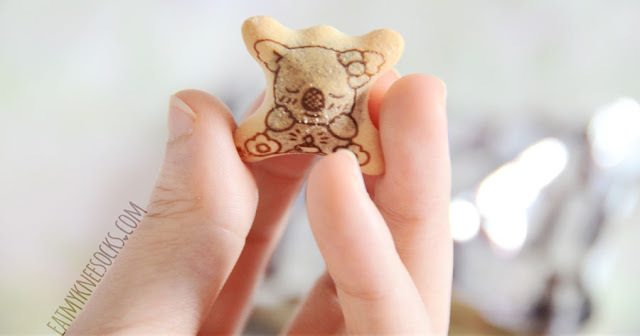 They're ultra-cute koala-shaped biscuits with creamy chocolate centers and different koala prints on them. What's not to love? Look at this adorable koala! Oh no! 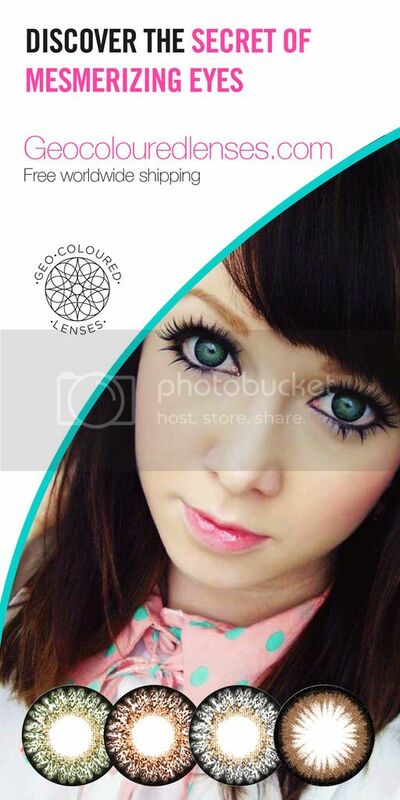 She lost her eyes! *No actual koalas were harmed in the making of this post. Here's how I'd rate the Japan Candy Box, in terms of pricing/value, taste, and adorability (is that a word?). 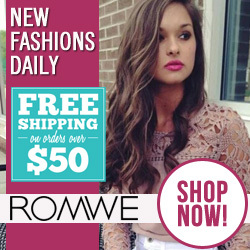 The price of these starts as low as $18.20 per month with free shipping. It's not a lot to pay, and you get a lot of variety. On the other hand, I'm taking away one heart because a lot of the items come in mini-sizes, so it doesn't end up being a whole lot of food. Everything in this Japan Candy Box tasted nice, and some items, like the dorayaki, the Koala's March biscuits, the Pikachu biscuit sticks, the fish gummies, and the Puccho chewy candies were really delicious! At this point, it seems like anything made by Blippo is bound to top my cuteness scale! These snacks and their packaging are so cute, quirky, and fun. 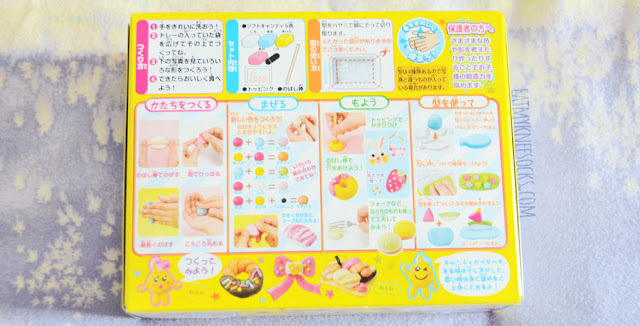 The Popin' Cookin' DIY candy kit is definitely among the cutest, while the Koala's March biscuits and Kabaya fish gummies tie for a close second. Everything from the individually-packed treats to the box itself is cute, and it really makes the perfect gift for yourself, or for anyone who loves adorable packaging and Asian snacks! 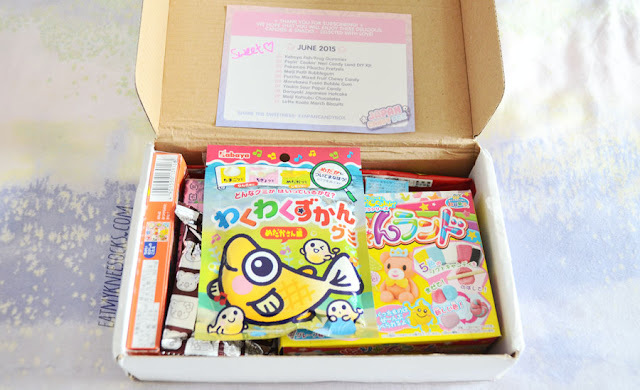 Overall, I love the June 2015 Japan Candy Box, and I had tons of fun trying out the snacks. Everything except the Pokemon biscuit sticks (which were a bit broken) came in perfect condition, and I think it was really smart that the people choosing the selections decided to avoid any easily melted items for the June box. As I mentioned before, it's not a lot of food that comes in each package, but it's so great to be able to test out all these candies and snacks that I've never eaten before, and the packaging makes me melt from its cuteness! 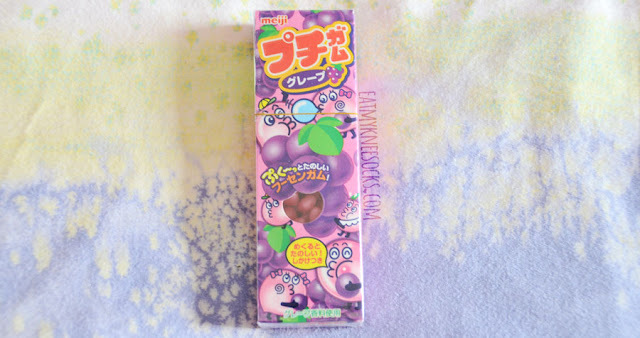 If these delicious and cute Japanese treats from the June 2015 Japan Candy Box made your mouth water, and if you want to win your own box of sweets, enter my giveaway below! One lucky winner will receive their own Japan Candy Box to taste and enjoy. 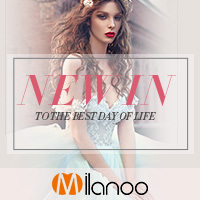 Be sure to enter quickly, because the giveaway ends soon! Thank you for sharing! Mind checking out my blog please?